A lovely package arrived in the post yesterday, containing the above newspaper. Its produced by Russell Davies and Ben Terrett, under the aegis of the Really Interesting Group, the new sort-of-organisation they’ve started to do projects for fun, money, or both. 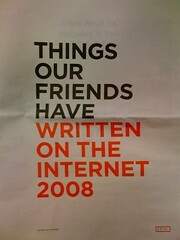 The newspaper is a collection of blog posts, tweets and pictures that Ben and Russell liked in 2008. It’s surprising the difference it makes to see web content laid out in print. Some things work much better in print – Dan Hill’s epic The Street As Platform blog post is something I’ve been meaning to read for ages, but never managed to when online. Offline, it was perfect for the commute to Hove from London last night. Images work very well, as they have the chance to play with scale – Matt Jones’ image of a rocket at NASA gets the centrespread, whilst Chris Heathcote’s photos of food are displayed as a grid over another double-page spread. Tweets are printed along the top of each page, above the main content, a brilliant analogue for their ‘running-commentary’ status. The exception is the entire twitter stream from @marsphoenix, printed over 4 pages with just three tweets highlighted in red – the one saying ‘i’ve landed!’, the one saying ‘we’ve found ice!’ and the very last binary code tweet. There’s something very elegaic about this sequence – it resembles the Vietnam Veterans Memorial in Washington. On the last page, Ben And Russell say that “2009 feels like a year for printing and making real stuff in the real world. Its going to be exciting”. I agree. I started work this week feeling really optimistic and ambitious, despite the newspaper that day being one of the most depressing i’d ever read. There’s something about the recession that clears the decks, exposes the charlatans, and creates more space for people to do stuff they love, care about or want to change. I’m really, really excited, about what will happen this year, and about discovering the new, exciting, and Really Interesting things that will be produced.